View More In Coffee Pod Holders. Lipper International has developed a complete line of woodenware products consisting of tableware, salad bowls, storage items, pantry ware and home organization items. These collections are continually refined and expanded. Discover a wide variety of practical, yet beautiful kitchen amenities designed to help you organize the practical side of your kitchen and pantry. From napkin and towel holders to spice racks and recipe boxes, simply select your favorite collection and add a decorative touch to every aspect of your room. 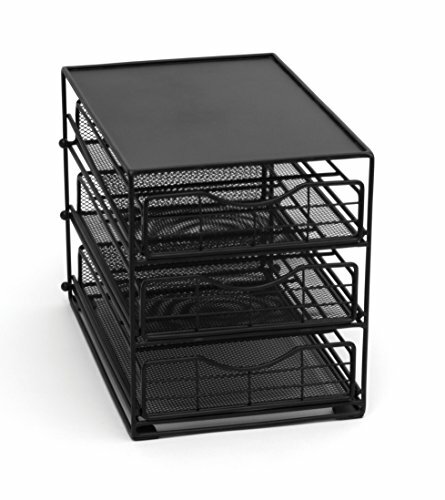 This black metal mesh In-Cabinet 3-Tier Coffee Pod Drawer can hold up to 45 pods. The black powder finish complements any decor. Black powder finish complements any décor; Measures: 7 1/8" x 8 1/4" x 10 3/4"